Morganfield’s® Singapore is ONE in September! Serving the Best Ribs in town to 100,000 customers since our opening on 17 September 2012, Morganfield’s® is ready to celebrate September in a smashing way to thank all the Rib Lovers in Singapore! Get ready Singapore! 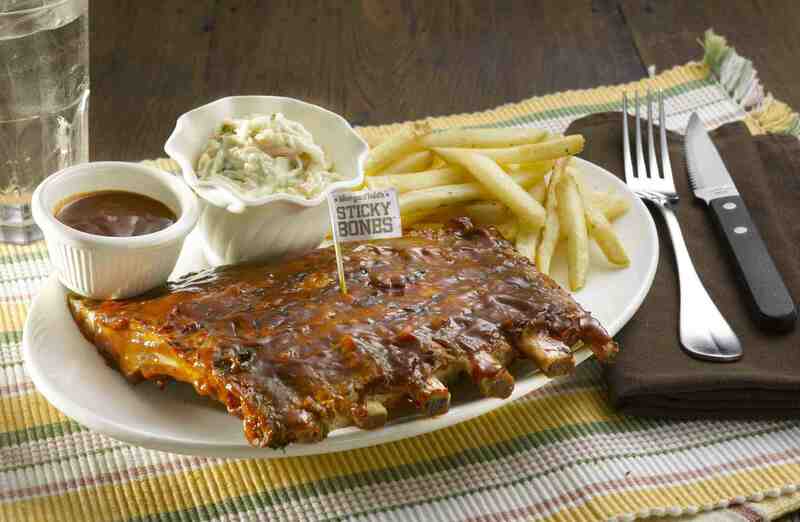 Morganfield’s® Singapore is giving Rib Lovers something to remember on 17 Sept 2013 (Tue) – Morganfield’s® famous Sticky BonesTM is selling at $1 nett! 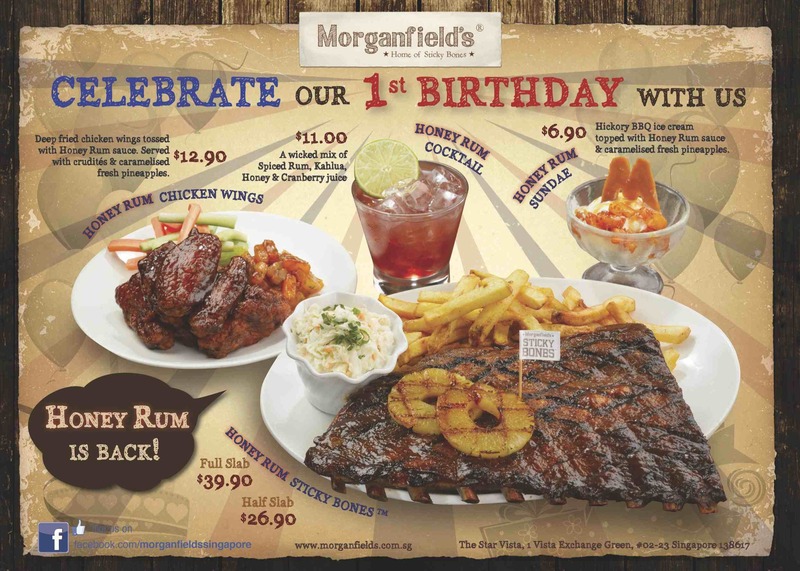 What’s more, Morganfield’s® Singapore is also throwing their first birthday party during their annual Ribfest event on 19 Sept 2013 (Thu) with generous spread of food, free flow of drinks and an opportunity to savour on Singapore’s Biggest Rack of BBQ Pork Ribs! For rib lovers who are not able to make it for either events, fret not, because Morganfield’s® is bringing back the all-time favourite– Honey Rum BBQ sauce for Sticky BonesTM this September and October. So, are you ready for a Sticky Good September? Time: From 11am till while stocks last 1 pound of mouth-watering off-the-bone prime spare ribs glazed with luscious Hickory BBQ sauce and served with french fries and coleslaw. There are only 500 sets of Half Slab Hickory BBQ Spare Ribs available on 17 Sept.
Morganfield’s® Singapore is holding their first birthday party in conjunction with the annual Ribfest event. The highlight for this year’s program is a specially created Mega Rib, the Biggest Rack of BBQ Pork Ribs in Singapore. Prepare to get awed by the sheer size of this Mega Rib, together with all the good food, good drinks and good company. Limited tickets are available and can be purchased from the Restaurant. You can also stand to win a pair of tickets to Ribfest 2013 for every $100 spend on a single receipt at Morganfield’s® from now till 13 Sept 2013. To extend the celebratory mood longer, Morganfield’s is bringing back a crowd favorite – Honey Rum BBQ sauce. Made with sticky honey, juicy pineapple and Bacardi rum, this special sticky-sweet BBQ sauce is definitely going to make your meal one to remember! This special sticky-sweet sauce will be featured not only in our signature Sticky BonesTM , but also on our appetizer, sundae and even cocktail! Honey Rum Sticky BonesTM – Half Slab $26.90 ++/ Full Slab $39.90++ Available as a choice of sauce, along with our regular Hickory BBQ, Smoked Peppercorn, Garlic BBQ and Spicy Tuscan. Honey Rum Chicken Wings – $12.90++ Deep fried chicken wings tossed with Honey Rum sauce. Served with crudités & caramelized fresh pineapples. Honey Rum Sundae – $6.90++ Hickory BBQ ice cream topped with Honey Rum sauce & caramelized fresh pineapples. Honey Rum Cocktail – $11.00++ A wicked mix of Spiced Rum, Kahlua, Honey & Cranberry juice. (1) Kids Eat for Free Available on Saturdays, Sundays and Public Holidays, kids below 8 years or 120cm in height will get to enjoy a free meal for every adult’s main meal. A maximum of two kids’ meals can be redeemed per table. (2) Top Value Set Lunch from $9.90 Available for dine-in from Mondays to Fridays (excluding Public Holidays), 11am to 3pm. There are 17 mains to choose from and each main comes with free starter of Soup of the Day or House Salad and free flow of soft drinks. (3) Happy Hour just got Longer Now serving pints of happiness all the way from 11am to 8pm, Mon-Sat and all day on Sunday. Buy 1 pint, free ½ pint for Happy Hour Draught Beer and nett price ($14.90/gls and $64.90/btl) for Happy Hour Wine. Not valid with other promotions and discounts. At the heart of Morganfield’s® is its signature dish – Sticky BonesTM – truly authentic, good ol’ fashioned, prime pork ribs slow-cooked and smoked to tender mouth-watering perfection, then basted with a sweet and tangy hickory flavored BBQ sauce.